Location - This group of islands is south of the Western Indian Ocean, about halfway to the Antarctic continent and midway between South Africa and Australia. Description - The region is classified in a common biogeographic province with temperature South Africa in the MEOW classification. In spite of note being within the WIO, its importance and distinctiveness have bee raised repeatedly during this study, so is mentioned in this report. 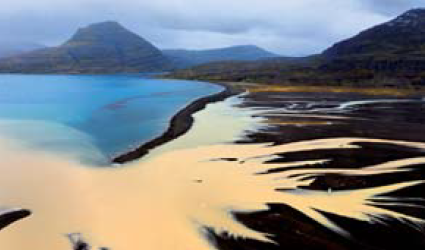 Geologically, the Kerguelen Islands are most distinctive, composed of a large island and more than 300 islands and islets covering a total area of 6500 km², on a massive continental shelf covering 100,495 km², itself on the submarine Kerguelen-Heard shelf of 2.2 million km² at a depth of approx. 1000 m. This shelf was produced by hotpost activity approximately 118-90 mya associated with a “superplume event” during the separation of India from the landmass of Australia and Antarctica, after the breakup of Gondwana. The plateau represents one of the largest volcanic outpourings globally, along with the Ontong Java Plateau in the western Pacific. The shelf interacts with the strong currents ringing the Southern Ocean, causing massive upwelling and productivity, supporting massive fish populations, marine mammals, seabird aggregations and others. The Crozet and Kerguelen islands are among the world’s richest seabird zones, with 46 breeding species. The most distinctive of these is the Critically Endangered endemic Amsterdam albatross (Diomedea amsterdamensis), whose sole population is estimated at 180 individuals (30 couples breeding on site per year). The Crozet Archipelago also hosts the largest colony of King Penguins worldwide (Aptenodytes patagonicus) with more than one million individuals. Overall, more than 25 million seabirds breed each year at Crozet, and at least as much to Kerguelen. This represents unique concentrations of birds world wide. Fifteen species of birds with at least half of the world population breed on the French Southern Territories. The islands are equally important for multiple species of marine mammals, including the southern elephant seal (Mirounga leonine – 400,000 breeding annually), the only population of Commerson's dolphin subspecies (Cephalorynchus commersonii ssp. ), the Antarctic fur seal (Kerguelen sea lions, Arctocephalus gazella) and Amsterdam sea lions (A. tropicalis), numbering up to 50,000 individuals, from just 100 surviving in 1956. Jurisdiction - France - the shelf defines the Exclusive Economic Zone of Kerguelen, operated under the Terres australes et antarctiques francais (TAAF), with the neighboring islands of Heard and MacDonald and their EEZ belonging to Australia. Threats - The remoteness of the islands has protected them from threats, though this also contributes challenges to effective management. 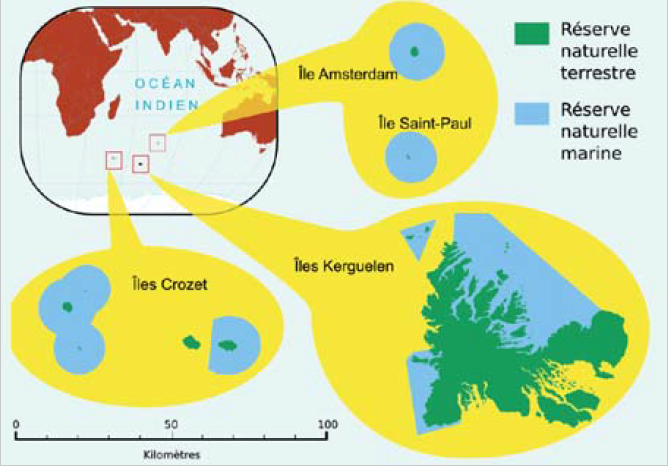 Also, because of their remote mid-ocean location, ocean and fisheries management has involved multi-country agreements. Nevertheless the integrity and condition of the area is very high as they are uninhabited islands, and they have good scope for consideration as a potential World Heritage Site.